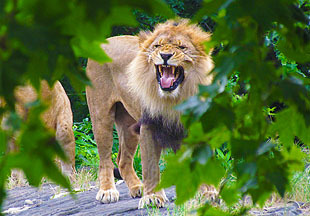 This particular king was photographed in his natural habitat, a savanna in the wilds of southern New York state, aka the Bronx Zoo. On the right is a next-door peacock, because — well, why not? 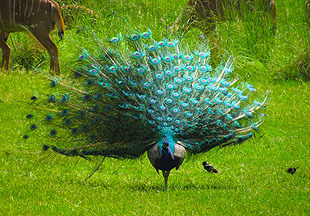 Peacocks are pretty creatures. I wish we had some around here. They couldn’t possibly make any more noise than the damn crows, and at least they spruce up the joint a bit while they’re screeching. Inkblot and Domino are fine, just taking the week off from their exhausting catblogging duties. They’ll be back next Friday.